From the birth of the United States, African American men and women have fought and died in defence of a nation that has often denied them many fundamental rights of citizenship. Now Gerald Astor has chronicled their efforts and accomplishments in this critically acclaimed survey. From Crispus Attucks, the first casualty of the American Revolution, to fighters on both sides of the Civil War, Astor moves to the postwar Indian campaigns and the infamous Brownsville riot. He also documents the prejudices and grievous wrongs that have kept African Americans from service,and finally traces their ascent to the highest levels. 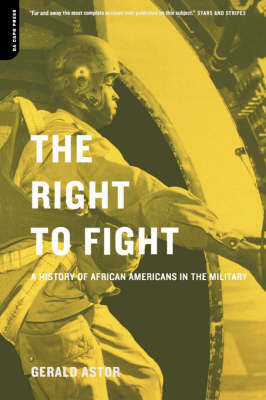 The Right to Fight is a ground-breaking contribution to American history.